Sometimes it’s tough to be a kid in Gladstone. Things are changing, and these are some of the scenarios younger children learn to cope with: Mum is working all the time now, but Dad is at home. Some of your mates drop their Dads off at the airport and he doesn’t come back for a month because his job is very far away. Maybe your brother just can’t keep up with the other kids, and Mum can’t figure out why. There’s a girl who lives nearby who just moved here; she says misses her grandma, who lives interstate. Wendy Morris from Gladstone Communities for Children is a firm believer in the power of supported playgroups to offer families a valuable lifeline through difficult times. She hopes events like last week’s Disability Action Week Open Day will help more parents connect with a neighbourhood playgroup. Getting kids into particularly supported playgroups provides enormous benefits in terms of social skilling, and there are qualified people available to help you identify developmental milestones or any issues your child may face. They also offer a network for newcomers to town or parents who feel isolated. “We have a changing demographic in our community; we also have lots of people moving to town because the housing affordability is here, there might be a misperception that lots of work is available in Gladstone.”. “With supported playgroups, there’s no cost attached, and sometimes there’s transport available to get parents and kids to playgroup; We’re really trying to connect with those families who might not otherwise get the opportunity to attend,” she said. Communities for Children, noticing a need in the community have started a Dad’s playgroup on Tuesdays, but anyone is welcome, for the more “boofy, blokey type stuff” according to Wendy. Dhubbeele’s indigenous playgroup is on Thursday, and a multicultural playgroup is held on Friday. Once again, all children and parents/caregivers are welcome on both days tel. 4972 8203 if you would like more information. 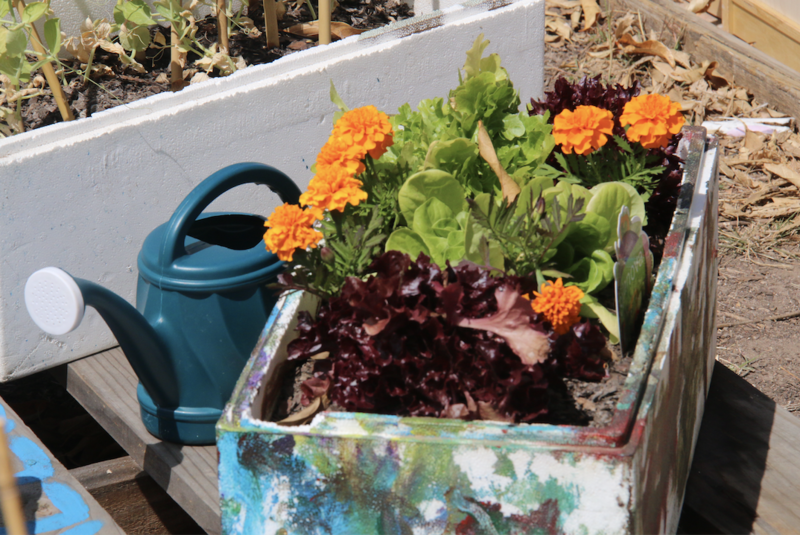 Marigolds and lettuce in the Play 2 Learn Playgroup Garden going strong.